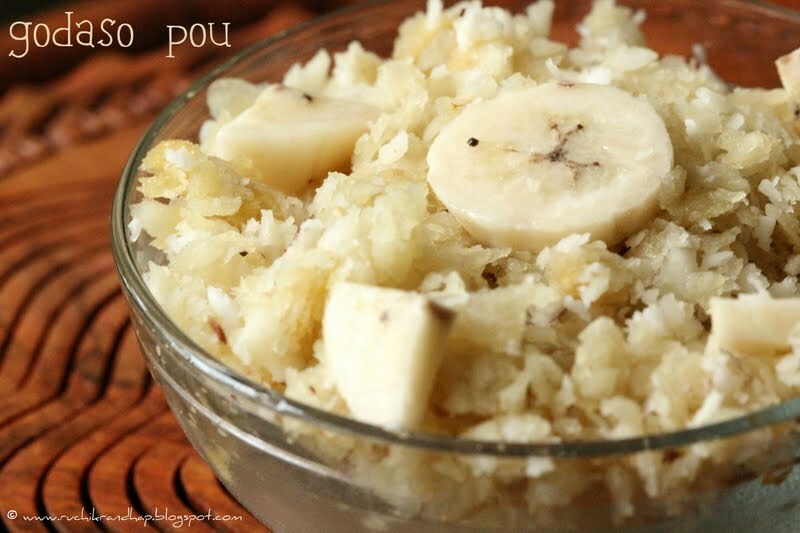 Godaso Pou (Sweet Beaten Rice/Poha) + Video! Wow! I never knew that the humble Poha or Pou as we call it in Konkani was so full of goodness in the health department! During my childhood the sight of Pou made me…well, yawn. I’d have a dismal look on my face when my mum made Pou as a tea time snack while my brother loved every bit of it. I would eat it only when it was garnished with bananas. It goes without saying that I didn’t try my hand at it after I got married even though my husband loves any version of Pou. 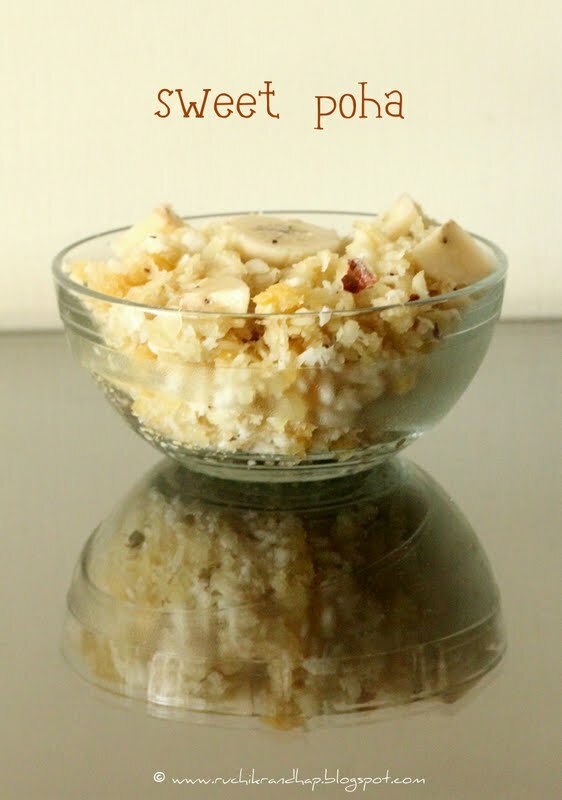 Thanks to blogging, I have been reintroduced to the Sweet Poha and although it has no real ‘recipe’ and is the simplest of all, I am posting it for the benefit of all those who enjoy simple, oil free and healthy snack recipes. When I finally made & ate this (maybe after 8-9 years! ), I totally loved it and wondered why I deprived myself of such simple pleasures of life. If you have never been too fond of the coconut, I am sure you will find this version interesting. The freshly grated coconut releases all its flavours when combined with the jaggery and cardamom. Although one can substitute the jaggery with sugar, it’s best to stick to jaggery (if it’s available) as it provides all the juicy sweetness. Sweet Pou tastes best with banana slices. 2. Mix the beaten rice only when you are ready to serve – else it will turn too soggy. we make it exactly the same way…love it…i'm going to make it tmrw..thanks to u . 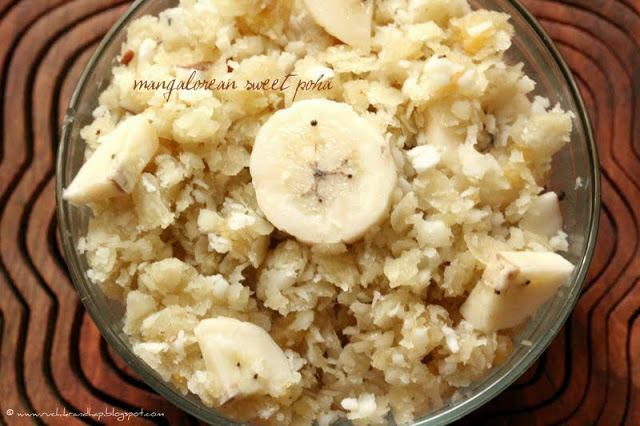 Absolutely divine, feel like finishing that whole bowl, simple but yet a delicious bowl of inviting sweet poha.. This is simply delicious!!! We make this during some poojas at home & we all love it!!! yummy snack always..I too prepare it in the same way!! simple and delicious poha..nice clicks..i too make in a similar way..
Looks Delicious!! Love your unusual recipes!! I leave out the jaggery and add ghee. Delicious. @vncbme: Thanks for your feedback!